Rating: Great food, annoying service! I hadn’t been to Gjelina (despite it being a favorite) in a few months but I headed back there for two brunches only a week apart, one with my son and the other with my brother and cousin. 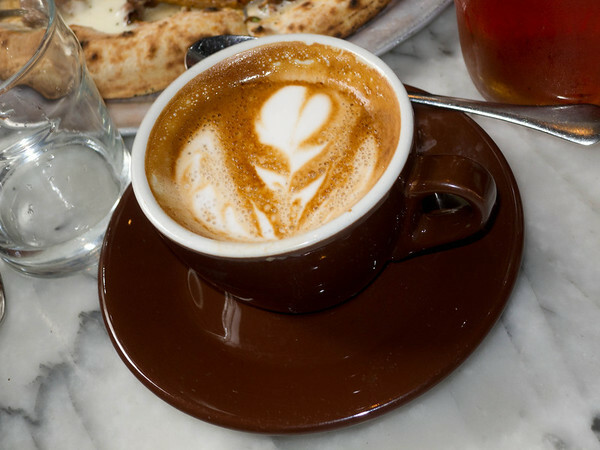 The all important Cappuccino. They make a good one as attested by the nice micro-foam. I’m not a fan of those coffee with a pile of foam on top versions. 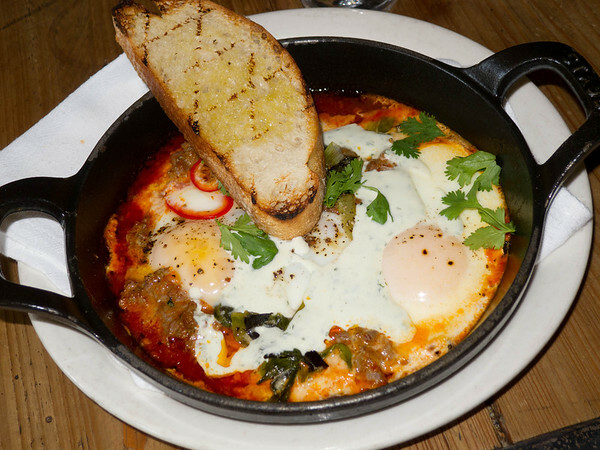 “Moroccan Baked Eggs with Merguez, Chili, Tomato Sauce, Cilantro & Spiced Yogurt.” This was REALLY tasty. The sausage was awesome, as was the sauce and yogurt combo. It had a pretty genuine Moroccan flavor profile. My son wanted eggs. He didn’t even touch them though. Toddlers! 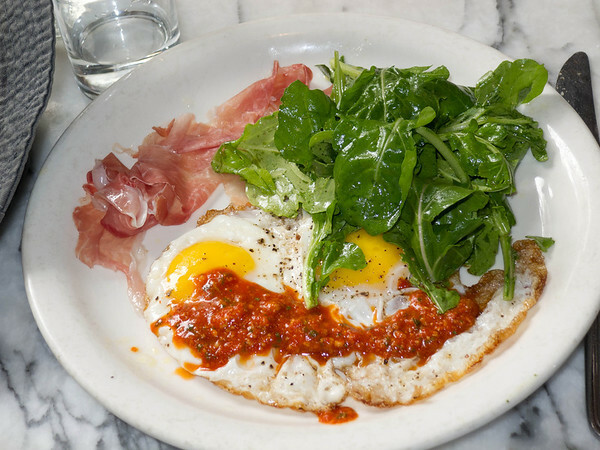 “Crispy Sunny Eggs with Prosciutto, Romesco, Arugula & Lemon.” This was also very good, and very similar (except for the ham) to my special Breakfast Eggs. 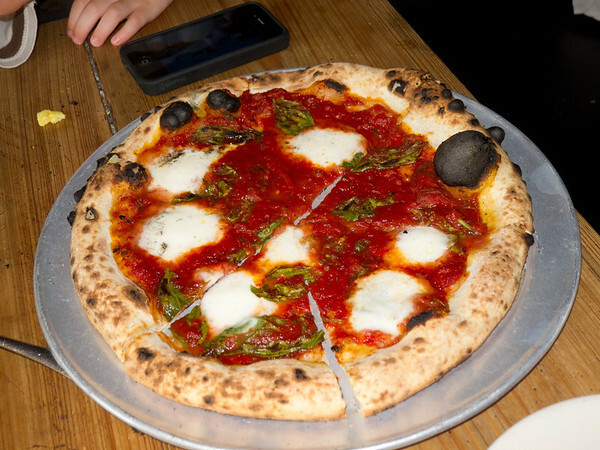 “Pizza Margherita.” A very nice version of the classic. Rich tomatoey sauce, lots of basil. My son ate most of this, although he complained about the “green stuff” and made me remove it. 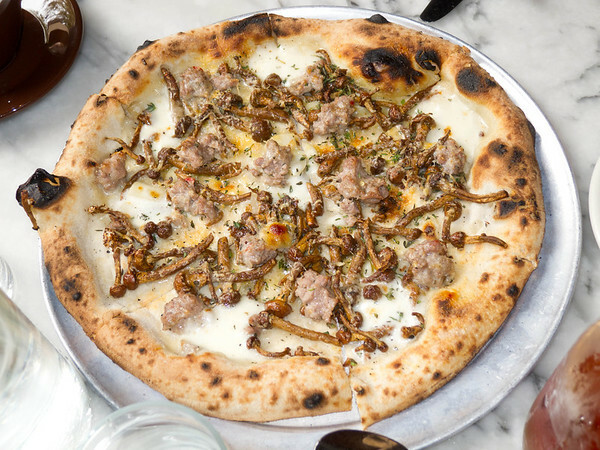 “Duck Sausage, Nameko Mushroom, Garlic & Mozzarella.” The sausage was fantastic, and the overall pizza was very smokey with an interesting chewy mushroom texture. I liked it a lot, but you certainly have to be a shroom person. 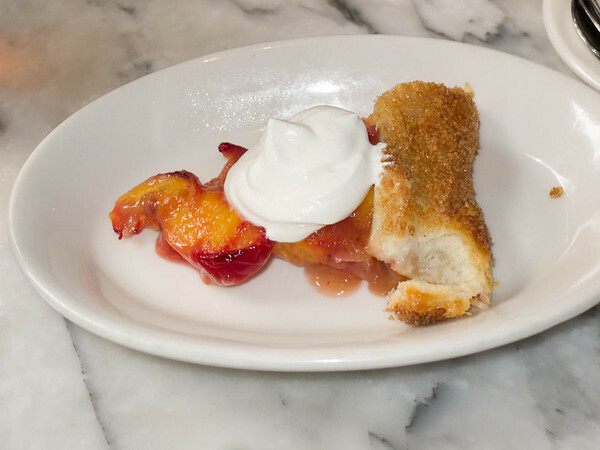 “Peach crumble with Crème Fraiche.” I like my crumbles more crumbly. 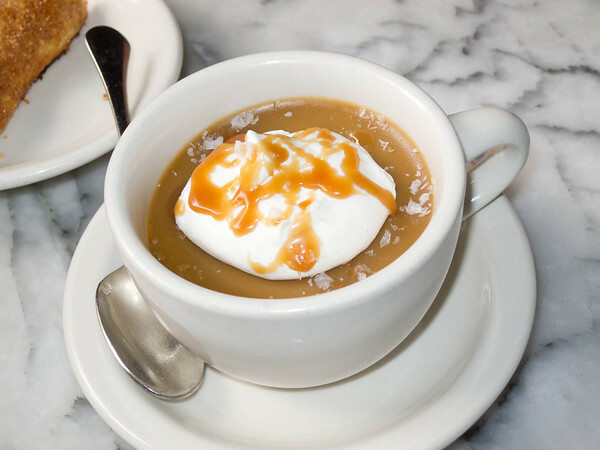 “Butterscotch Pot de Crème with Salted Caramel w/ Crème Fraiche.” This is just incredible as always. I could eat like 10 of them. Bad me. Bad me. 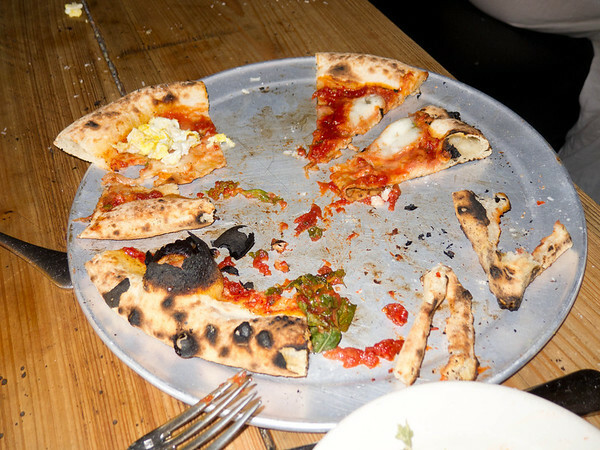 Overall, the food at Gjelina is fantastic as always, but I need to snark about the service, and I’m not the first. Apparently the owner/managers even like to hire staff with attitude! Boo hiss! The first time, I asked to get some eggs that on the menu had strips of bacon on top with the bacon on the side (or gone). I was told (very rudely) that I could remove the bacon myself. In this day and age of people with dietary restrictions this just isn’t acceptable. I can understand not building totally custom dishes, but trivial omissions? Give me a break. On the second trip we ordered some vegetables which didn’t come (the waiter read them back to us too). Plus similar with an ice tea even after asking about three times. Eventually, after the waiter went AWOL we found him and brought up both. He didn’t even apologize. 10 minutes after that he brought the ice tea and said he’d take it off the bill. Ooh ah, $4 ice tea for free (it’s all profit anyway). We mentioned something to the manager. He didn’t apologize either, just nodded his head. Then finally, about 5 minutes after that he snuck back and apologized, like it had been eating at him and he felt he needed to. There was no offer of a freebee or anything. My brother asked him point blank about that and he took a dessert off the tab. I go for the food, but they do need to lose a bit of the ‘tude. You can check out two other Gjelina reviews HERE and HERE. Or my index of LA Restaurants. 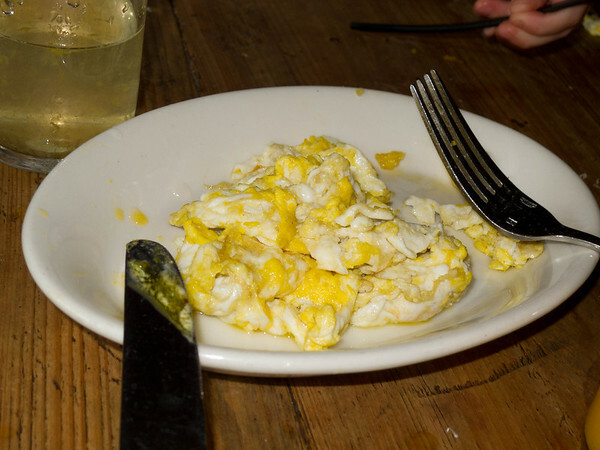 This entry was posted in Food and tagged Abbot Kinney Blvd, Breakfast, Brunch, California, Cooking, Dessert, Eggs, Fruit and Vegetable, gjelina, Merguez, Pizza, Prosciutto, Restaurant, Restaurant Review, Romesco, Sausage, Tomato sauce, Venice.